The origins of the Purulia Chho go back to the many indigenous forms of dance and martial exercises that were found in the barren Chhota Nagpur plateau. The rajas of Bagmundi, tribal Bhumij chieftains who acquired kshatriya status, and who had gradually established their supremacy in the tribal habitat, had a seminal influence on the dance and were responsible for introducing features such as the mask and narrative style from the Hindu epics for which the form is now famous. 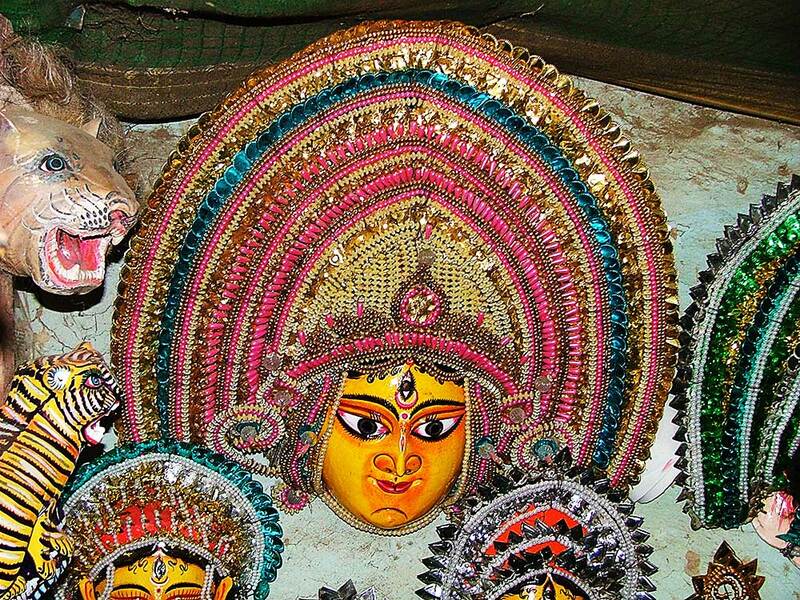 The craft of mask making along with the Chho dance has been a tradition in Purulia for well over a century. Traditionally, the Chho dance is a part of the annual Chaitra (mid March to mid April) Parab (festival) when one agricultural cycle ends and a new cycle begins, but serious practice goes on throughout the year. Tribal men are the performers of this martial dance, mostly from the families of traditional artistes or from local communities. In addition to the virility of the form itself, the most notable features of the genre are the dresses and masks. In Chho dance every character, divine, human or animal must appear with a mask, appropriate for its identification. 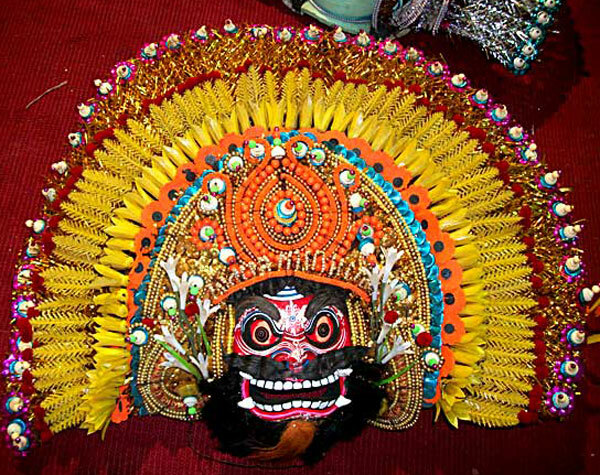 The masks depict characters from mythological stories, various gods and goddesses, animals, birds and demons. The making of the masks is an independent art altogether. 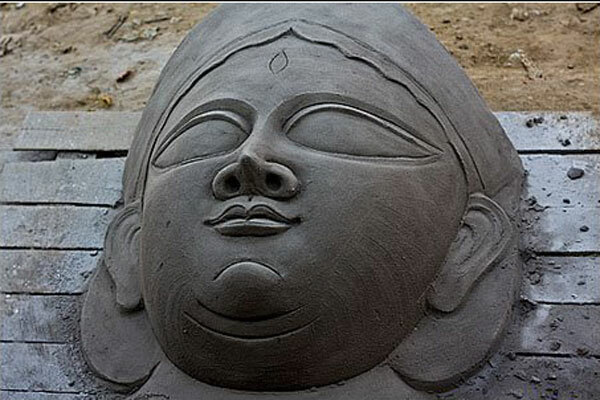 It needs a gifted artist with knowledge of the epics to visualize the mask and then give shape to it. Until recently it was the Shutradhars of Chorida village in Baghmundi thana who had the sole responsibility for making the dance masks - with more than 250 villagers engaged in mask making through the year. For generations together, masks have been made by the Shutradhar community, artisans who were originally wood carvers by profession and who are caste Hindus well versed in the epics. Their knowledge is traditional and hereditary and is not based on individual learning. This village has produced many national award winners. These shutradhars also make clay images and have increasingly begun to depend more on the market for clay images for their survival. 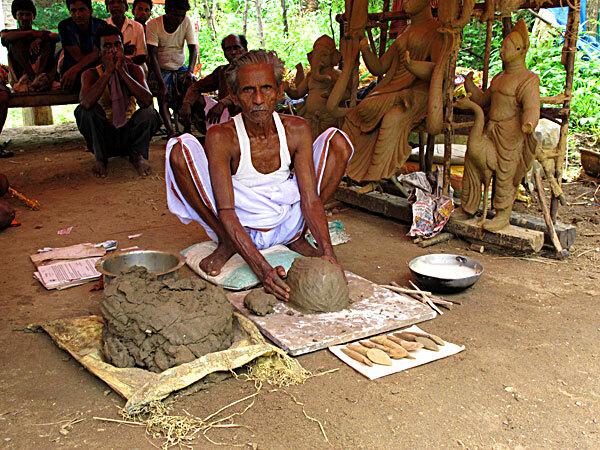 Before the ‘puja’ season, for 3 to 4 months, most of these shutradhars travel to various parts of the country to execute orders for clay idols. 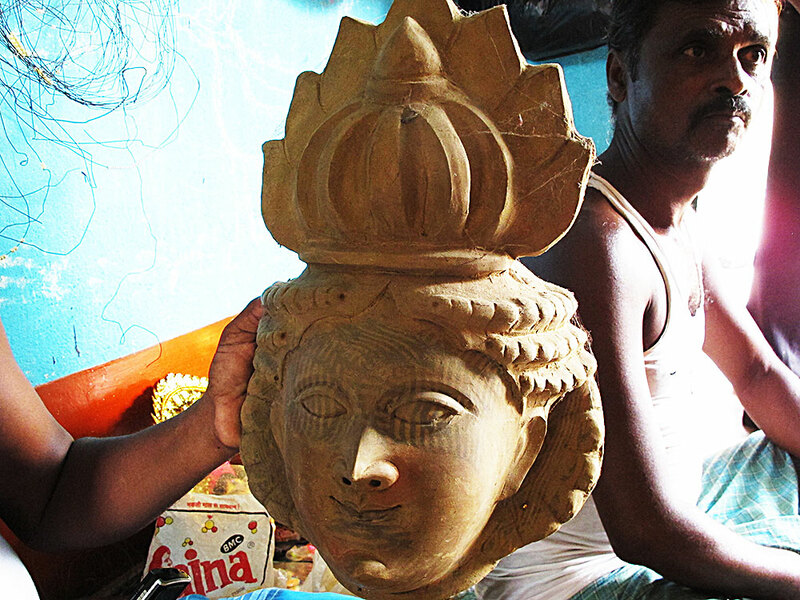 The month of Phalgun (February-March) is the mask making season for Purulia Chho – in readiness for the Chaitra Parab. The earlier masks were made from light wood and the decoration was simple – they were engraved with the features of the character and painted in different colours to make them attractive and lively. The colours used then were vegetable dyes. But making these wooden masks, was a laborious and time consuming process, and thus these were gradually replaced by the much lighter papier mache masks. The stages of production of a papier mache mask start with the making of a clay model of the mask.This is smoothened and polished with different sizes of spatulas or thapi which are also used to mark out the facial features, the details of the crown and so on.The model is then dusted with finely sifted wood ash and partially dried out in the sun.This is then layered over with gummed strips of paper, covering the entire surface. About seven to eight such layers are added. This is then coated with moistened clay and left to dry again. Strips of rags soaked in a solution of a kind of sticky clay are then pasted over the entire surface and the facial features smoothened and redefined with a spatula. The mould is then left to dry in the sun. Once dry, edges are trimmed and the mask is now ready to be detached from the mould by scraping or gently knocking off the clay under it. The mask is now ready to be painted and embellished. There was a time when the decoration on masks was much simpler, with the ornamentation being done only in clay. However, as the popularity of the dance and these masks grew, artisans vied with one another to make their masks more attractive. Thus the decorations became more and more elaborate and therefore much more expensive.  As a result the cost of making a mask shot up, leaving much smaller margins for the artisan. Moreover, a team of dancers who would require at least 40 to 45 masks for their entire repertoire would now need to spend at least Rs 100,000. This had a two-fold impact: demand for the masks reduced, with affordability being a key factor and on the other hand the large investment necessary to manufacture the more expensive masks became a problem. Many dance troupes unable to afford the masks or unable to get enough programs from the government or at local functions to make good the expensive investment, started folding up. The unfortunate result of this has been that most mask making artisans struggle for subsistence and many have shut down shop. Others try and make do with the production of the smaller decorative masks which have been successfully showcased market at government fairs in the cities from the nineties or so. 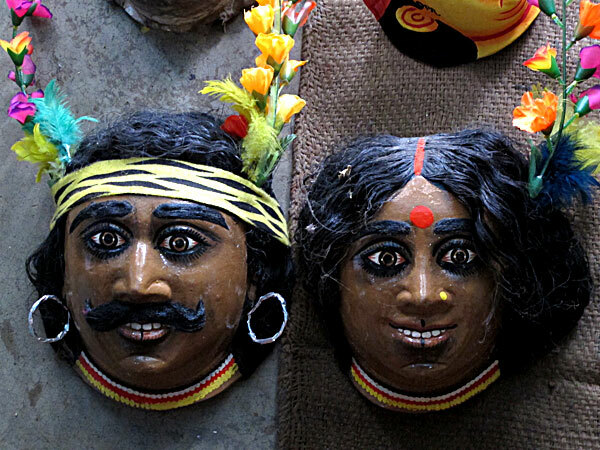 Of these, the Santal (tribal) man and woman masks have proved to be quite popular. Besides its importance to culture, Chho is crucial to the local economy. There is a global audience for this folk art form, and a large number of families earn their livelihood by performing and selling masks and dresses. But the future does not look bright, as a lack of care, an absence of marketing and government apathy threaten its growth. Few young people are willing to take up Chho given the financial uncertainties that surround it and prefer more secure occupations.